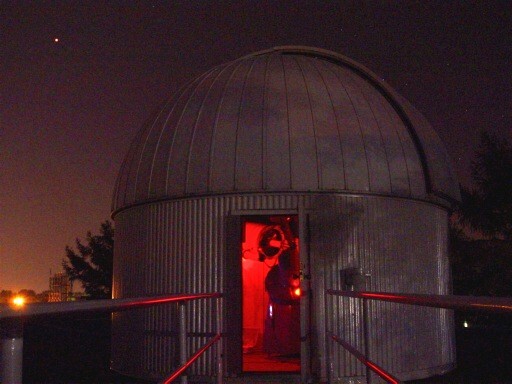 For long time I was not aware of the 16inch telescope located at the roof top of the Earth Science Department @ SUNY Albany. Today provided very nice opportunity to invite students for stargazing through twitter and Phil's Black Board page. It was dark enough by 7 PM. 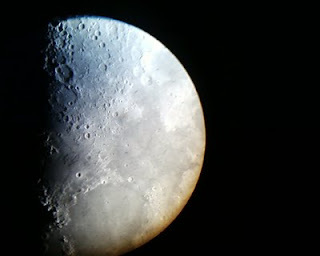 The night sky was very very clear. 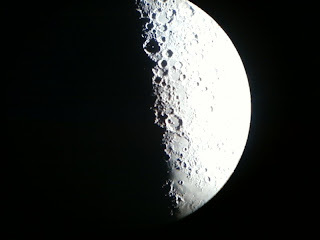 We did some observations including Moon and Jupiter. 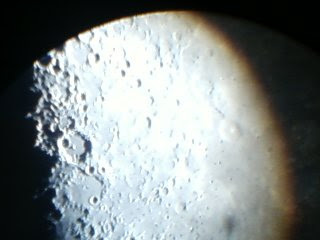 Here are some pics taken by my Mobile. Got a blurred version captured. 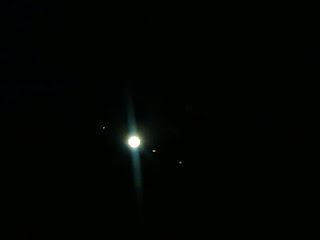 You can see three of the Jupiter's Moons. The scientific publications by Americal Physical Society has been viewed as very prestigious materials by/among the scholars. Physics Frontline is the latest effort to bring out discussions on general topics aimed to public and members. Physics Frontline covers the latest scientific news, analysis and commentary on the intersection of physics with science policy issues, including innovation, education, energy, climate change, and nuclear policy. I had also written about the "Physics", the online publication of APS, spotlight kind of site for Physics with interesting materials here... http://www.nabinkm.com/2008/11/subscribe-to-physics-new-venture-of.html. The aim of "Physics.aps.org" was to highlight some interesting viewpoints, trends and promote the discussions with synopses. I suppose the aim of Frontline is going to be more oriented towards general public. Looking at few postings in there, I can see that it is more towards the policy or the concurrent view of physics. The American Physical Society is the leading professional organization of physicists, representing over 47,000 physicists in academia and industry in the United States and internationally.